Wishing Well or Gift Registry cards are the perfect way to share with your guests your gift preferences for your upcoming wedding. Most couples are now choosing to include wishing well cards, with a request for cash gifts to put towards their honeymoon or future home rather than accepting traditional wedding gifts. We recommend you check out our templates of beautifully written wishing well wording and poems. Our selection of templates has been chosen specifically to ensure your guests will appreciate the effort you’ve put into making this request in a respectful and polite manner. Traditional wedding etiquette suggests that it is inappropriate to send your wishing well card with your invitation, however this is purely a decision of personal preference. 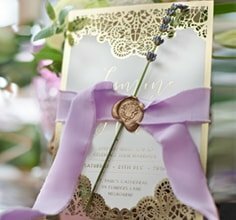 Giant Invitations has endeavoured to create a range of uniquely designed wishing well and gift registry cards, which will complement any of our elegant wedding invitations.